The House Science Committee is not our finest committee. In 2012, a then-member of the committee, Paul Broun (R-Ga.) referred to "evolution, embryology, Big Bang theory, all that" as "lies straight from the pit of hell." When the committee holds hearings, they're mostly about aliens: National Journal reported this year that the committee held more hearings on extraterrestrial life than on climate change. And those alien hearings are generally a mess, focusing on pop culture and fear-mongering than actual inquiry. During a hearing on extraterrestrial life last year, senior SETI astronomer Seth Shostak fielded questions like, "Have you watched Ancient Aliens and what is your comment on the series?" (Shostak's response was, "Pyramids were built by Egyptians") and, with regards to a hypothetical discovery of alien life, "What's the plan? Do we announce it to the world?" 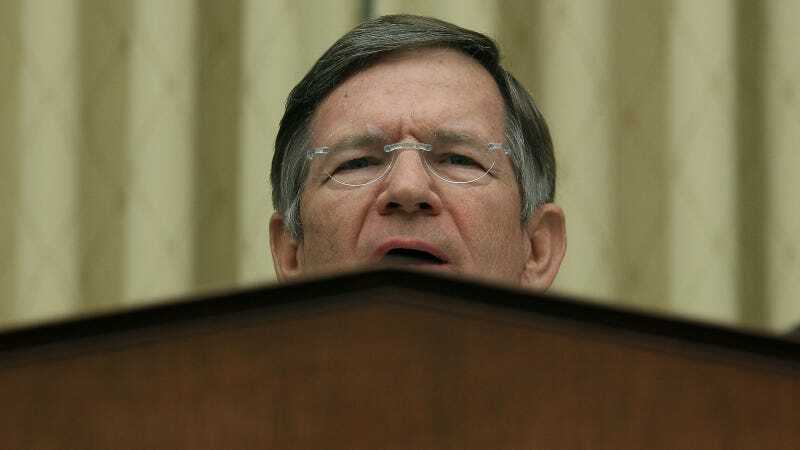 Smith… a prominent congressional skeptic on climate change, issued the subpoenas two weeks ago demanding e-mails and records from U.S. scientists who participated in the study, which undercut a popular argument used by critics who reject the scientific consensus that man-made pollution is behind the planet’s recent warming. Smith’s document request to the National Oceanic and Atmospheric Administration ordered the agency to turn over scientific data as well as internal “communications between or among employees” involved in the study, according to a letter Friday by the House committee’s ranking Democrat, Rep. Eddie Bernice Johnson (Tex.). What’s the most embarrassing and inconvenient truth for the cause of climate alarmism? Probably the fact that there has now been no “global warming” for 18 years and six months. Not only does this contradict all the doomladen climate models cited in the IPCC’s various reports – none of them predicted the so-called “Pause” – but it also means that not one of the kids in school being fed climate propaganda by their on-message teachers has ever personally lived during a time of global warming. So it’s quite understandable that… the alarmists are doing their damnedest to write the “Pause” (or, if you will, “hiatus”) out of scientific history. NOAA likely wouldn't have faced this kind of request a few years ago. Politico explained in January that the science committee was one of several to see more lax subpoena processes this year. The new rules allow some committee heads, including Smith, unilateral subpoena power. The call for internal documents is, then, a loaded one, and so far NOAA has ignored the request. But NOAA spokesperson Ciaran Clayton told Nature that "we stand behind our scientists, who conduct their work in an objective manner… we have provided all of the information the Committee needs to understand this issue." Though I can find no legitimate stated purpose for your demands for these communications in any of your letters to NOAA, I am concerned that the Majority has a different and wholly illegitimate purpose for this request. I cannot help but note that your requests in this case echo the tactics of notable climate change skeptics, who frequently submit similar FOIA requests of climate scientists in both the federal government and in state universities.